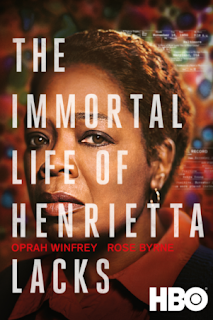 Oprah Winfrey stars in the true story of a woman's search for enlightenment about her mother--whose 'immortal' cells would save millions of lives. Henrietta Lacks was an African-American woman whose cells were used to create the first immortal human cell line, known as HeLa. Told through the eyes of Lack's daughter Deborah (Winfrey) and journalist Rebecca Skloot (Rose Byrne), the film chronicles Deborah's search to learn about the mother she never knew, and to understand how the unauthorized harvesting of Lacks' cancerous cells in 1951 led to unprecedented medical breakthroughs. Co-starring Renee Elise Goldsberry, Reg E. Cathey, Courtney B. Vance, Ruben Santiago-Hudson, Leslie Uggams and Reed Birney. Directed by George C. Wolfe; screenplay by George C. Wolfe and Alexander Woo; based on the book by Rebecca Skloot. This movie isn't the kind of movie I would usually watch but sometimes it is good to get out of your comfort zone and try something new because you never know, you might be surprised. I think I probably would have liked the book more (which usually it the case) than the movie. It isn't something I would watch again but I am glad I watched it because it was interesting. This is a powerful story that will make you cry. So if this kind of tear jerker kind of movie is what you are into you might enjoy it. The Immortal Life of Henrietta Lacks is a true story .